Ana is a certified personal trainer and Tabata Bootcamp instructor. 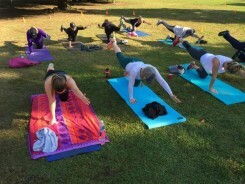 She became “addicted” to outdoor fitness after she realized how fast her body was responding and how amazing it felt to exercise with others in the great outdoors! Ana is fun and energetic to be around and her energy is definitely contagious! Teaching and sharing the importance of meal preparation. 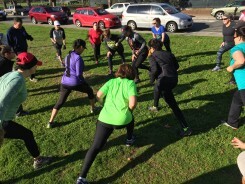 Leading and assisting group workouts. Meal plans & Grocery Store 101: How to shop and prepare healthy meals.